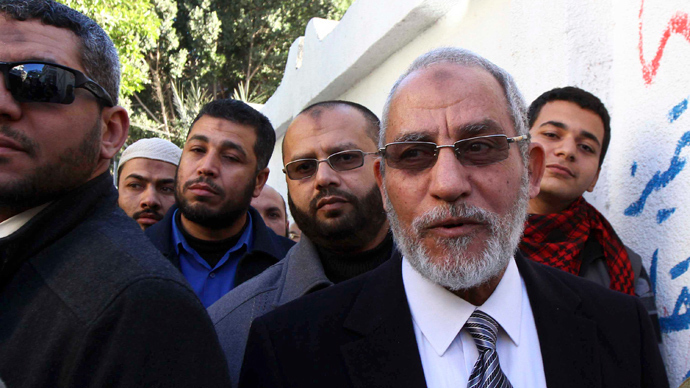 Authorities in Egypt have arrested Muslim Brotherhood leader Mohamed Badie at an apartment in Nasr City in Cairo’s northeast. Badie had already been charged with inciting the murder of protesters in June. Confirmation of Badie’s arrest came through various international wires which cited Egyptian state media. The news was later followed by a post from the country’s interior ministry to its Facebook page which included an image of Badie at the time of his arrest, flanked by two men in black body armor sitting in a vehicle. "Carrying out the decisions of the public prosecutor to arrest and bring forward the 'general guide' of the Muslim Brotherhood, Mohamed Badie, and through collected information and observation of movements, it was possible for the criminal search apparatus under the direction of Cairo's security [services] to arrest him," the Facebook post said. Badie, 70, was due to appear in court on August 25 - along with two of his deputies - to face charges involving an incident that occurred in the wake of former President Mohamed Morsi’s removal from office by the country’s military. The prosecutor’s office charged the Muslim Brotherhood leaders in July of inciting violence that resulted in the deaths of 55 members one week after Morsi’s ouster. Security forces located and arrested Badie close to Rabaa al-Adawiya square, where Islamist supporters of deposed President Morsi had held a sit-in that was subjected to a bloody crackdown on Wednesday after refusing orders by the military to disperse. Badie remained defiant despite the removal of the Muslim Brotherhood from power. In July, the party leader described the president’s overthrow as an act that was worse than destroying one of Islam’s holiest shrines, the Kaaba. “I swear by God that what [Gen. Abdel-Fattah] al-Sissi did in Egypt is more criminal than if he had carried an axe and demolished the holy Kaaba, stone by stone,” Badie said. Last weekend saw the dramatic storming of a mosque in Cairo’s Ramses Square, which had also doubled as a field hospital for pro-Morsi protesters. Badie’s son, Ammar Badie, was shot and killed during protests near the mosque on Friday. Meanwhile, Egyptian Prime Minister Hazem el-Beblawi has indicated that legal dissolution of the Muslim Brotherhood is possible. “It is being studied currently,” said government spokesman Sherif Shawky on Saturday, according to AP.